The game itself consists of the screen scrolling up at a steady pace. Platforms are randomly distributed in the game area. The player must jump or climb from platform to platform to keep the bottom of the screen from “eating” them. The sides of the playable area steadily constrict to represent the narrowing of a light house tower. To make things interesting the player is currently suffering from sleep deprivation (hence the title of Insomnia). This is represented by a graying around the area furthest away from the player. As the player grow more tired the graying area gets smaller and smaller until it consumes the player in the darkness of sleep. The player’s movement and jump height are also hindered by sleepiness. 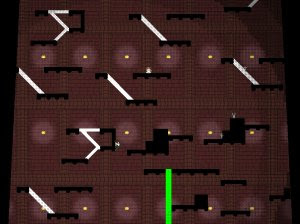 To counter the sleepiness the player can find and take various power ups scattered about the level.